My Grandfather Colonal John Francis Sharp - Commanding officer of the Army Hospital Unit from Utah. Seen here before heading off to establish a field hospital in the conflict with Pancho Villa, near the Mexican border. He was the units commander during World War I as well. My Grandfather is holding Uncle Gil, who later taught at the New York Art Academy with Uncle Mahonri Young. Standing next to him is his wife Sally Luella Ferin Sharp, who was a Handcart Pioneer descendent and star Soprano of the Salt Lake Oprea Company. She was a favorite student of Madame Von Klenner where Colonel Sharp and she met in New York while taking instruction from her. The oldest child, front and center is Marion, who later was a fulbright in Opera, and member of the Paris and San Francisco Opera Companies. 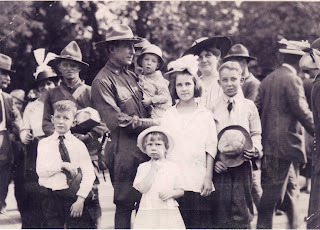 The tallest boy next to her was Klink (Klenner), named after Madame von Klenner and Bones (Harlow), my fathers older brothers and Naval Doctors in the Pacific in WWII. In the foreground is Aunt Martha, she later married Wallice Toronto and wrote a book called "A Cherry Tree grows behind the Iron Curtain". This picture was taken in Liberty Park, Salt Lake City, Utah, circa 1916.